In a post released today on PopMatters, Kris Ligman rightly describes Bastion’s narrative as both entrancing and confining. As she states, “It wasn’t long at all until I felt like I was being held captive by the narrative, rather than engaging with it. I have known scripted cutscenes that have felt more interested in player agency than this.” Yet this gives the game a "truly strange and wonderfully entrancing" feel. 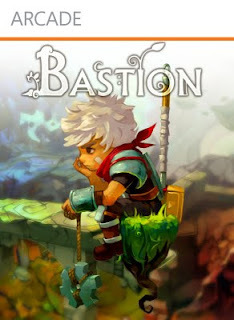 SuperGiant Games, their first title released as part of Microsoft’s “Summer of Arcade,” managed to use Bastion’s linearity to make a game about choice. The world of Bastion is constructed of floating tiles, the remnants of a once great city succumbed to a mysterious “calamity.” The remaining pieces of the environment appear before The Kid, the game’s protagonist, as he walks, supplying narrow pathways and arenas through which he navigates. The map very much constrains the player, veer to far in either direction and the Kid might fall off into the void. The world map itself ushers players along in with few divergences or options. The game’s dynamism comes from its rich RPG elements. Players have a great deal of choice when it comes to how they want to play. With eleven unique weapons, each with five tiers of upgrade options, ten possible tonics to equip that grant passive bonuses, and an assortment of special skills to employ in battle, the amount of combat combinations is enormous. Additionally, players can invoke deities to make combat more difficult. All of these choices matter. Besides weapon combinations, the divine invocation that make the game harder also dramatically affect gameplay. While some simply make enemies more resiliant, others make them quicker or cause grenades to drop upon death, forcing players to adapt accordingly. These gameplay decisions are also informed by the game’s narrative. Ruck, Bastion’s narrator, comments on player decisions as they occur (although not with such frequency as to become annoying). Select a certain weapon combination, and the player might hear “That’s just plain overkill. Come on.” Ruck might also comment on your favored weapon of choice, recognizing your preferred play style. Additionally, the weapons, gods, and abilities all tie into the game lore. The play choices reflect the Kid’s relationship to the past and future of Bastion, making them deeply personally and narratively significant. There are only two traditional narratives choices during the end of the game, neither of which I will spoil here. Both decisions, particularly the final one, are emotionally powerful. In a world devastated by hatred and the folly's of the past, the games asks, what does it mean to forgive? How do we make amends for the choices of others? By asking these questions in the confinement of the game, Bastion reminds us that even in constrained environments, our decisions matter.